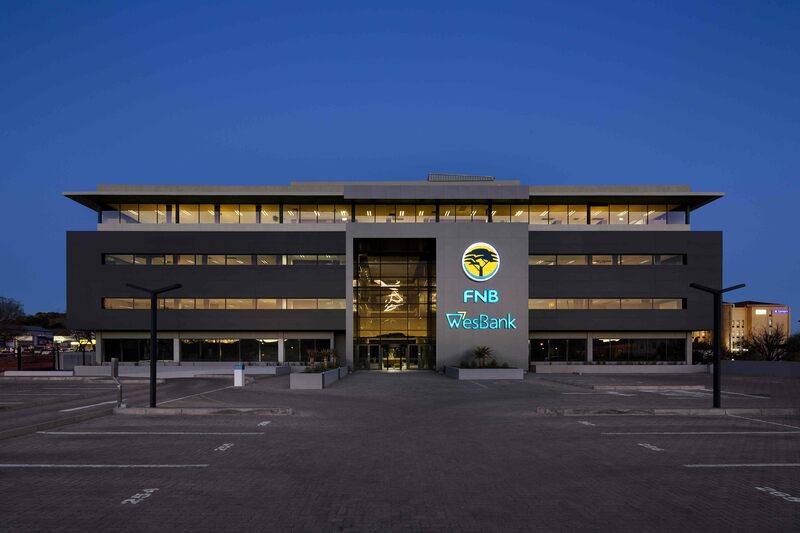 First National Bank Regional Offices, one of the first new buildings in the Bloemfontein 2nd Avenue redevelopment. With close collaboration with the client, we have designed a corporate icon for the skyline of Bloemfontein. 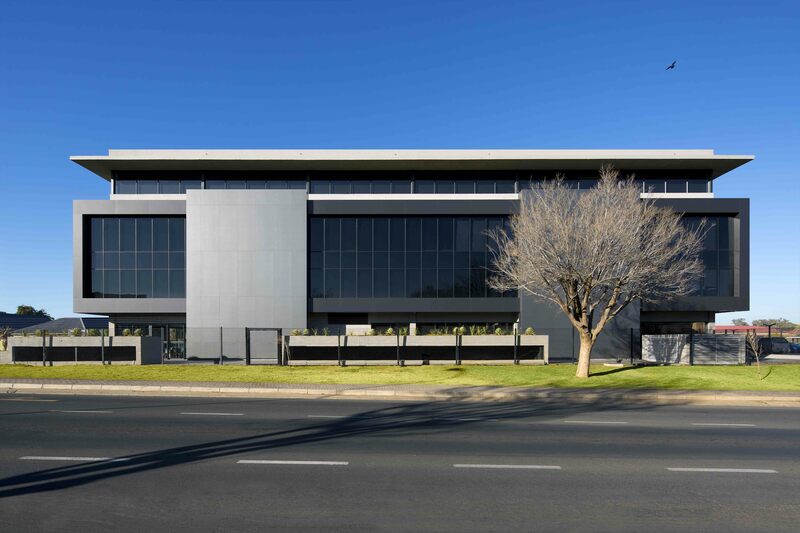 Located in a prominent position, bounded by Nelson Mandela Drive, Zastron Street and 2nd Avenue, means this new building is easily accessible for both employees and clients. To create open floor plates with views, the planning design consolidates the services to the central core. The result is an extroverted building with floor plates with 360 degree views Various eco-friendly features have been incorporated. 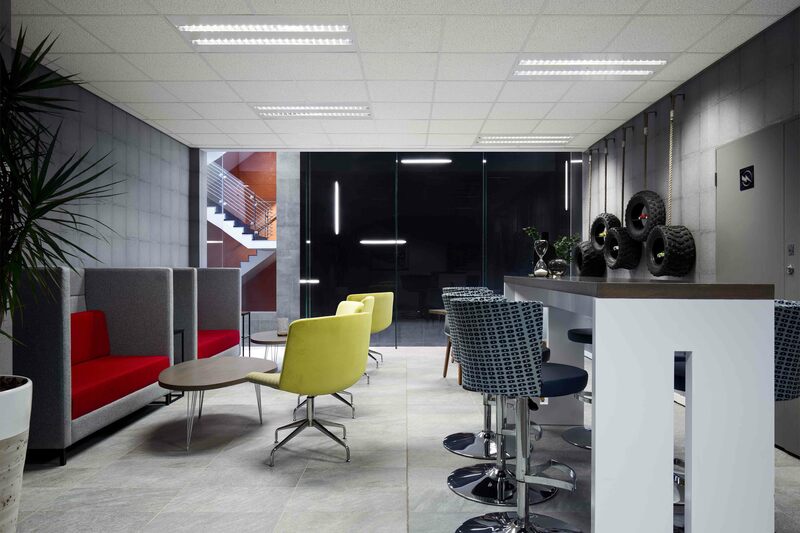 The atrium is designed to maximise natural light with a new acrylic sheeting product instead of glass that achieves both the required heat gain and insulation values. A 100KWp photo voltaic solar system is designed for the rooftop that generates 170MWh of power per annum. Less glazing and more cladding on the west facade accommodates the intense afternoon sun. The exterior is a dark grey, large format, scratch resistant ceramic cladding tile that expresses the secure, corporate banking aesthetic. 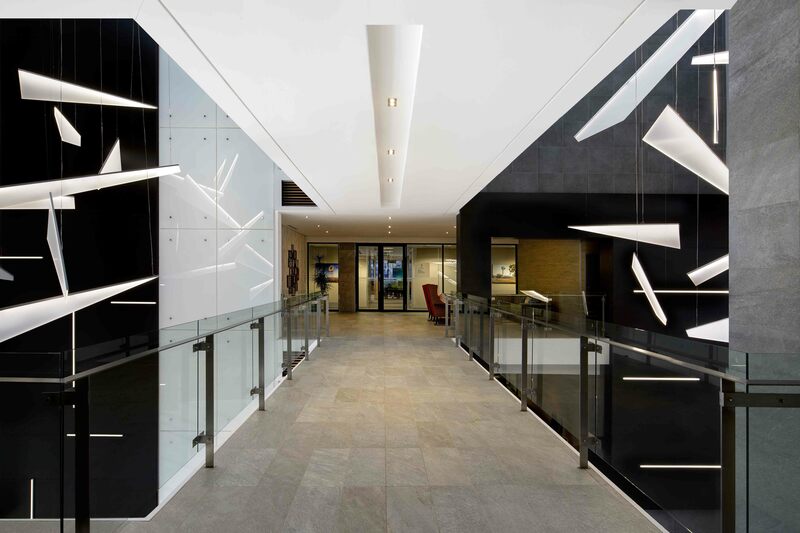 The interior reflects the regional status of the Freestate building and is inspired by the natural materials and palette colours of the bushveld. 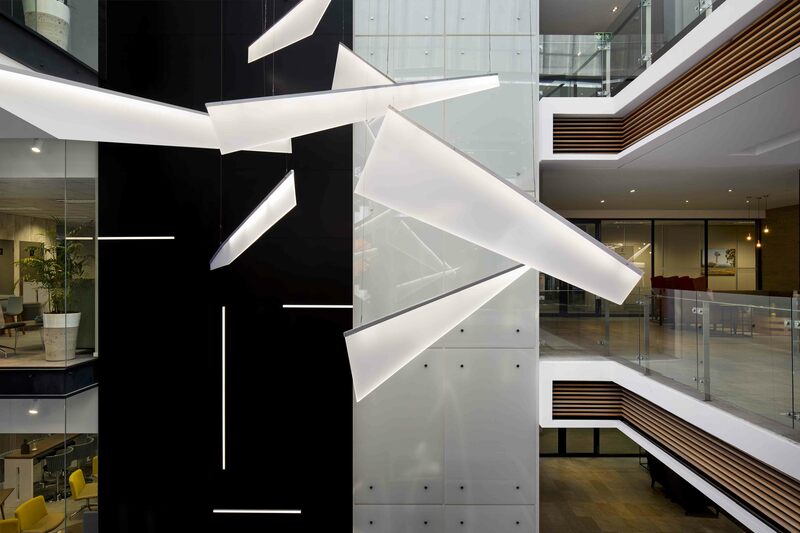 The sculptural fitting creates an edgy deconstructed mood against the ordered interior facades. 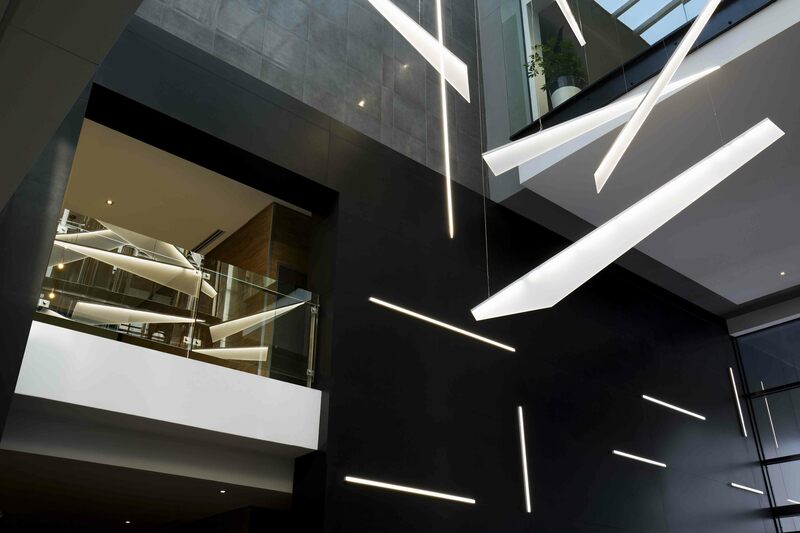 The bespoke chandelier, appearing as shards of glass, creates tension in the space, which is not foreign to a corporate environment. It is sculptural and designed to fill the volume whilst balancing out the forms of the interior. 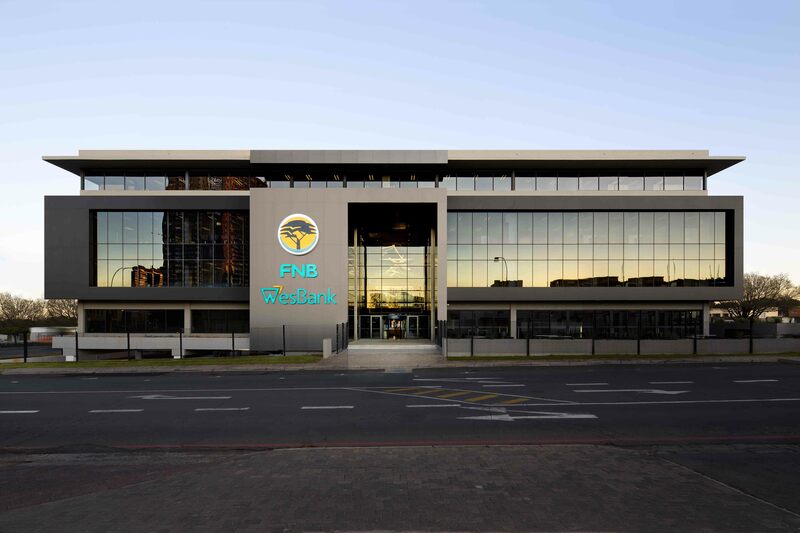 The FNB building is the catalyst for the start of a new mixed use lifestyle precinct for 2nd Avenue, designed by Bomax Architects. 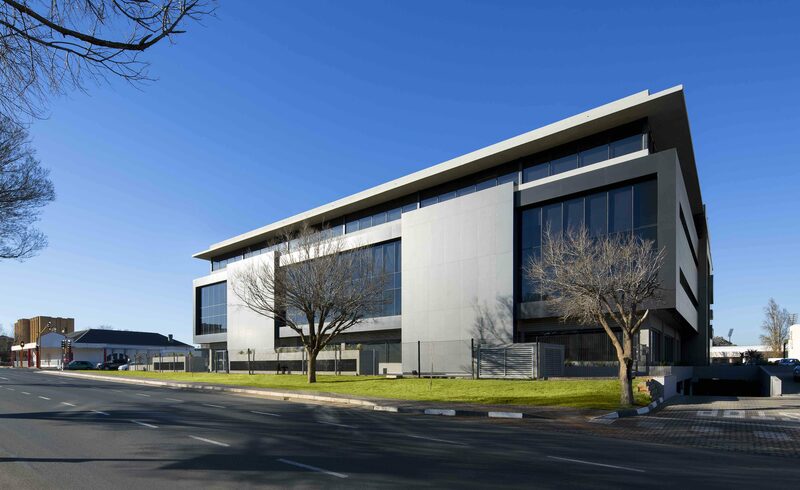 Bomax Architects has been working on this precinct project for the past 8 years, taking into account the environmental, heritage and traffic issues while creating an accessible design that the community deserves.